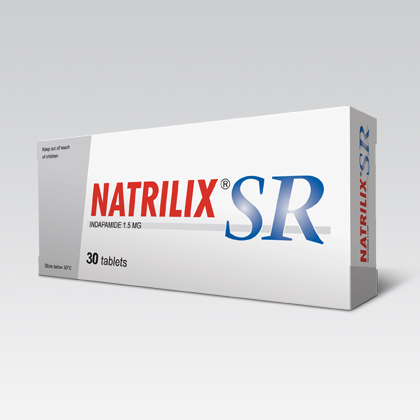 1- WHAT NATRILIX SR, sustained-release film-coated tablets IS AND WHAT IT IS USED FOR? This medicine is intended to reduce high blood pressure (hypertension) . It is a prolonged-release film-coated tablet containing indapamide as active ingredient. Indapamide is a diuretic. Most diuretics increase the amount of urine produced by the kidneys. However. indapamide is different from other diuretics. as it only causes a slight increase in the amount of urine produced. If you have been told by your doctor that you have an intolerance to some sugars. contact your doctor before taking this medicinal product. * if you have severe liver disease or suffer from a condition called hepatic encephalopathy (degenerative disease of the brain). * if you have low potassium levels in your blood. * if you suffer from gout. * if you need to have • lest to check your paralhyroid gland. You should tell your doctor if you had photosensitivity reactions. Your doctor may give you blood tests to check for low sodium or potassium levels or high calcium levels. Athletes should be aware that NA TRIUX SR contains an active ingredient. which may give a positive reaction in doping tests. The use of this medicinal product is not recommended in patients with problems of galactose intolerance, lactase deficiency or glucose-galactose malabsorption (rare hereditary diseases). * cisapride. diphemanil (used to treat qastro-lntestinat problems). * baclofen (to treat muscle stiffness occurring in diseases such as multiple sclerosis). * potassjum-spareq diuretics (amik>ride, spironolactone, triamterene). * metformin (to treat diabetes). * iodinated contrast media (used for tests involving x-rays). * tetracosactide (to treat Crohn’s disease). Ask your doctor or pharmacist for advice before taking any medicine. This medicine is not recommended during pregnancy. When a pregnancy is planned or confirmed, the switch to an alternative treatment should be initiated as soon as possible. Please tell your doctor if you are pregnant or wish to become pregnant. The active ingredient is excreted in milk. Breastfeeding is not advisable if you are taking this medicine. This medicine can cause side effects due to lowering of the blood pressure such as dizziness or tiredness (see section 4). These side effects are more likely to occur after initiation of the treatment and after dose increases. If this occurs, you should refrain from diving and other activities requiring alertness. H(MI8Ver, under good control,ihese side effects are unlikely to occur. This medicine contains lactose monohydrate. 3. HOW TO TAKE NATRllIX SR, sustained-release film-coated tablet? One tablet each day, preferably in the morning. The tablets can be taken irrespective of meals. They should be swallowed whole with water. Do not crush or chew them. Treatment for high blood pressure is usually life-long. If you have taken too many tablets, contact your doctor or pharmacist immediately.A very large dose of NATRllIX SR could cause nausea, vomiting, low blood pressure, cramps, dizziness, drowsiness, confusion and changes in the amount of urine produced by the kidneys. If you forget 10 take a dose of your medicine, take the next dose at the usual lime. D0 not take a double dose to make up for the forgotten dose. As the treatment for high blood pressure is usually life-long, you should discuss with your doctor before stopping this medicinal product. If you have any further questions on the use of this product, ask your doctor or pharmacist. Like all medicines, NATRllIX SR, sustained-release film-coated tablet can cause side effects, although not everybody gets them . * Common «1/10, >1/100): low potassium in the blood, which may cause muscle weakness . * Uncommon « 11100, >1/1000): vomiting, allergic reactions, mainly dermatological, such as skin rashes, purpura (red pinpoints on skin) in subjects with a predisposition to allergic and asthmatic reactions. – Increased risk of dehydration in the elderly and in patients suffering from heart failure. – Aogioedema and/Of” urticaria, severe skin manifestations. Angioedema is characterised by-swelling of the skin of extremities or face, swelling of the lips or tongue, swelling of the mucous membranes of the throat or airways resulting in shortness of breath or difficulty of swallowing. If this occurs, contact-your-doctor immediatEHy. – If you suffer from systemic lupus erythematosus (a type of collagen disease), this might get worse. Cases of photosensitivity reactions (change in skin appearance) after exposure to the sun or artificial UVA have also been reported. – increase of calcium in blood. –Life-threatening irregular heart beat (torsades de pointe). 5. HOW TO STORE NATRILlX SR, SUSTAINED RELEASE FILM -COATED TABLET ? Do not use this medicine after the expiry date which is stated on the carton and blister. The expiry date refers to the last day of that month. This medicine should be stored at temperature not exceeding 2S”C, in a dry place. lndapamide …. .. .. 1.5 mg for a sustained-release film-coated tablet. In the tablet core: anhydrous colloidal silica (ESS1), hypromellose (E464), lactose monohydrate. magnesium stearate (E470B), povidone. In the film-coating: glycerol (E422), hypromellose (E464), macrogol 6000, magnesium stearate (E470B), titanium dioxide (E171). White, round prolonqed-reiease film-coated tablet.